The concert proved to be very significant on a personal level, instigating the ongoing collaboration with Tim Howle which would develop into Electroacoustic Movies over the following years. Midnight Meat Train and Subplot from the ‘Cinema for the Ear’ programme being developed into the first two pieces of the Electroacoustic Movies collaboration. Subsequent to the concert, I have edited the source material into single screen pieces to give an indication of the original live visual mix on the night. môr(G)wyn features footage shot by Nick Cope edited to a composition by Andrew Lewis, originally composed for Sound/Gallery, Copenhagen. Andrew Lewis writes, “môr(G)wyn was composed specifically for performance in Copenhagen Town Hall Square on a sunterranean computer-controlled sound system called SOUND/GALLERY, the 25 loudspeakers of which are embedded just below the surface of a pedestrian area of the Square.. Computers beneath the Square control the ‘choreography’ of the sound in space. Copenhagen’s Little Mermaid sculpture is a tourist landmark of seemingly benign fairytale innocence, yet the mermaid myth itself hides something altogether darker. Like the sea itself, the surface beauty of mermaids and sirens disguises enormous destructive power. môr(G)wyn explores the indivisible relationship between beauty and danger associated with both the mermaid/sirens myth and with the sea, by bringing together two pools of material – sea sounds and womens voices- in two contrasting musical manifestations, one violent the other lyrical. The title môr(G)wyn is a fabricated word containing a number of (mainly Welsh) resonances, including sea, death, girl/maiden, white/blessed, mermaid. The Eyes of Truth features video material animated, shot and generated by Nick Cope and edited to a sound piece by Doug Smith featuring samples of Mohammed Ali, originally composed by Smith in 2002. This work was also screened at the University of Hull’s SEA’ 03 concerts and international conference in 2003. Midnight Meat Train features time-lapse footage shot by Jackie Jones (Sheffiled) and Peter Care (Chicago), and originally edited by Nick Cope for live projection work in the late 1980s and early 1990s with music group Cabaret Voltaire. For this version the footage was mixed with Joe Audsley’s Win Amp animations and mixed live and later edited to Audsley’s audio composition ‘Midnight Meat Train’. This edit was subsequently developed by Tim Howle into his collaboration with Nick Cope, composing a brand new soundtrack which would become the video piece ‘Open Circuits’. ‘Inside Information: Materia Medica’ features animations by Nick Cope taken from contemporary and historical medical imaging sources in an aesthetic treatment of scientifically and medically derived footage, and edited to Tony Ginty’s composition ‘Nil by Mouth’. 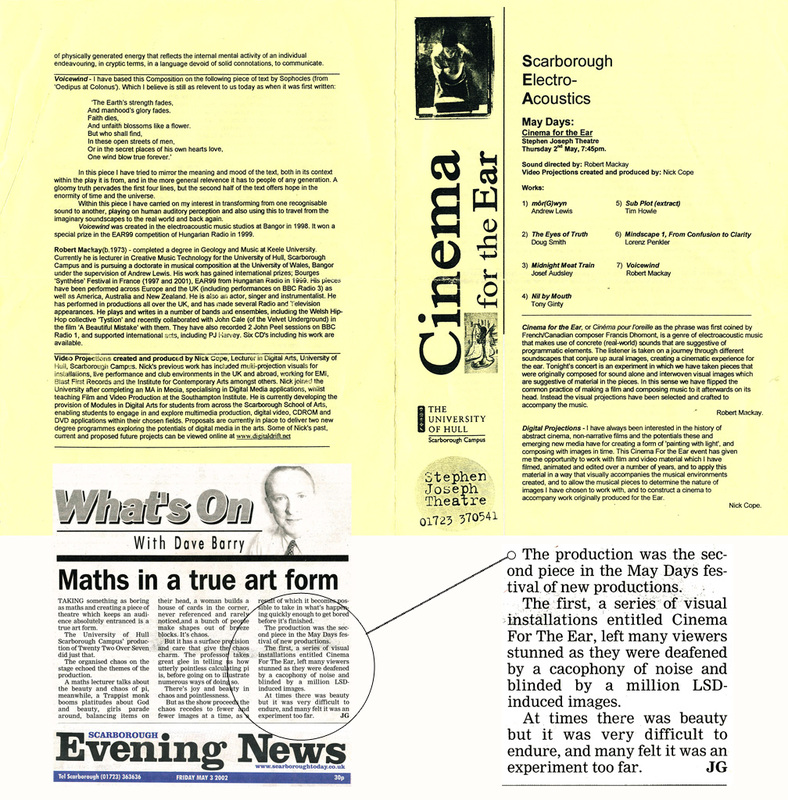 Son et Lumières was a later edit of both the sound (an extract of Tim Howle’s composition Subplot) and visual material originally presented live in the Cinema for the Ear programme. Developed from and reworking the source materials into what became the second of the collaborative Electroacoustic Movies video works with composer Tim Howle. Lorenz Penkler’s composition ‘Mindscape 1: from confusion to clarity’ becomes the basis for this edit deriving from the source material projected live in the original performance and subsequently titled d_film//mindscape 3.1. Rob Mackay’s composition Voicewind was composed in the electroacoustic studios at Bangor University in 1998, winning a special prize in the EAR 99 Hungarian Radio competition. Based on Sophocles text from ‘Oedipus at Colonus’, Mackay tries to mirror the meaning and mood of the text and its relevance across generations, whilst examining his interest in transforming recognisable sounds, playing on human auditory perception and travelling back and forth between imaginary and real world soundscapes. The footage is a reworking of the video camera recording of the output of a video waveform monitor, first explored in Nick Cope’s edit for Mandragora’s Jazz Message in 1999. Programme notes and review in the local press. Anecdotal evidence reported that Sir Alan Aykbourn left this performance midway through, commenting backstage that ‘there are many things you can do in a theatre, and that’s not one of them’! Lady Aykbourn, however, remained for the whole performance and is said to have enjoyed it. A Cinema for the Ears is a term and concept originally developed by Canadian composer Francis Dhomont (‘cinéma pour l’oreille’).